It's not as simple as an obvious inconsistent print. Most women dream of owning a designer handbag. We don't mean a "designer" handbag, picked up for P25,000 from a sketchy man at the local market, but a genuine, real-deal piece of leather luxury. The trouble is, it is quite difficult in this day and age not to end up with a knock-off by mistake, as copies can be so good that only an expert could tell the difference. You might save all your spare cash for three years only to end up with a faux on your arm. But the good news is, New York start-up Entrupy has identified this as a real issue and created a device that can spot a slightly wonky print or lopsided clasp an absolute mile off. 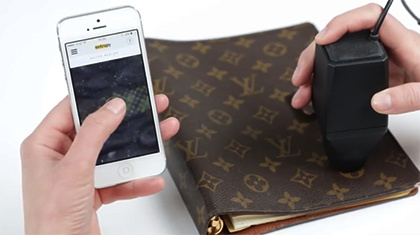 The microscopic scanner magnifies objects by a whopping 260 times, meaning that any slight inaccuracy in a handbag will be picked up in a flash. The camera then sends images of the product in question directly to an app, which scans "tens of millions" of photographs of more than 30,000 handbags and wallets. According to the company, the nifty technology will instantly pick up any signs of a counterfeit, including tiny gaps in leather grain, misshapen prints and overrunning paint. The user will be told in just 15 seconds whether it is a genuine handbag or a big fat fake. Unfortunately, the bad news is that this tech is far from cheap. It costs $300 (P15,313.50) to lease the gadget but Bloomberg has reported that 160 businesses have already signed up to use it, making it the perfect device for online marketplaces, secondhand stores, and pawn shops. In just one year, the Entrupy is said to have improved accuracy by a staggering 98 per cent for designer brands including Louis Vuitton, Hermes, Gucci, Fendi, and Chanel.